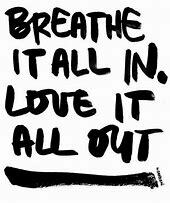 I cannot over emphasise the value of this breath in everyday living. Please take a little time to read the previous blogs on the yogic breath parts 1, 2 & 3. Practice each part. It will give you a greater understanding of how this works but a summary follows. As always, if you have a medical condition and you are unsure please check with your health care provider. From the moment you took your first breath, your breath has been breathing you unconsciously. Air has passed in a rhythmic way from your nose, down your throat, to your larynx, down your trachea, through your bronchi and ever decreasing in width bronchioles to the tiniest of air sacs called alveoli. These resemble the tiny bubbles caused by the washing up liquid in your sink. They pop open to receive the gases and allow the essential oxygen to move into the blood where it gets circulated around the body. As you read this, were you able to imagine it in your mind? Using these images you can attach to the air you breathe an image of ‘life force’, ‘chi’, or what certain traditions call ‘prana’. The practice of breath control in yogic terms is called pranayama. (Prana = life force which is sustained by breathing & Yama = mastery or control). As you breathe in you can imagine, sense, visualise or feel ‘light’, healing or love come into your body with the in breath and tension, pain or self judgement leaving with the out breath. Take a moment and breathe normally, then take a deep breath in and breathe all the way out. Using the techniques previously described place your hands on your tummy and breathe in to this area for a count of two. Then raise your hands to your lower rib cage and breathe into here for a count of two. Then raise your hands to your upper chest and breathe in here for a count of two. Relax your hands. At this point you can hold for two if you do not have high blood pressure. (If you have problems with high blood pressure, simply skip holding your breath). Then slowly begin to breathe out. Do not be in a hurry. Breathe out for a count of 8 if you can. This lengthens the out breath and brings calm to the body. Repeat the entire exercise three times. Putting together all three parts of the yogic breath has several advantages. It oxygenates the blood bringing life to a tired body. It opens up the lungs helping fight infections here. It massages the internal organs and increases the circulation. It calms the mind as you focus on what you do. -reducing the secretion of adrenaline and other fight, fright & flight hormones. Remember when you have practiced it a few times you don’t have to use your hands any more. So you can use it anytime & anywhere. At work, during sports, or relaxing, it will bring clarity, focus and relaxation. Please enjoy & remember the incredible nature of your own body.